Pillow cases are soft even with no greater than 650 thread count. Burgundy is a beautiful color! Use White Vinegar with detergent to prevent fading. Coordinates perfectly with the Antique Chic quilt by Greenland Homes! Add a touch of luxurious comfort to your bed with the Superior Egyptian Cotton 650 Thread Count Solid Pillowcase Set. These pillowcases feature a 100-percent Egyptian cotton construction with solid pattern that is available in a variety of stylish colors that you will be sure to love. Please note: These are pillow cases ONLY. I should have read the fine print more carefully. When a product is titled Egyptian Cotten 650 thread count you don't expect it to be 40% polyester and 600 thread count. I'm sure it's fine, it's just not what I expected. Title should be cotton blend so everyone is clear on what they are buying. I could have found better at a department store for the same price. 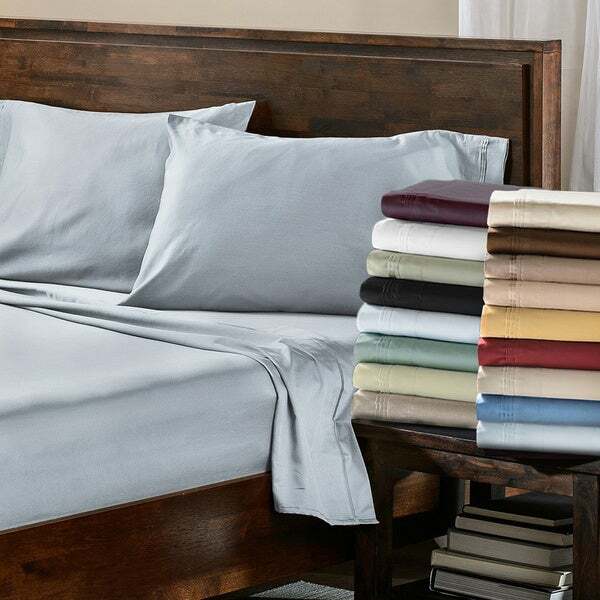 Egyptian Cotton 650 Thread Count Solid Color Pillowcase Set. I bought these pillow cases so I could have extra pillows on my bed. I liked the pillow cases so much I ended up buying the matching sheet in the same color. We were pleased after buying 4 Cal-King Oversize Egyptian Cotton 650 Thread Count Solid Color sheet sets (Item #: 11406140) . We began to mix and match a couple pillowcases on our 4 bed pillows using the various sets. It was then we decided to purchase this spare pillowcase set in ivory, Item #: 11217298. After getting the shippment, we should have guessed something was amiss; we unpacked the plillowcases from standard kitchen saran wrap with a photocopied label made of blk/wht printing paper; touching the pillowcases revealed they were no match for the sheet sets ordered 2 weeks earlier, despite the photo of the pillowcases and sheet sets being the same for each item. We are hoping OS approves an RMA. Closing on a good note: the oversized/pintucked solid sheet sets (Item # 11406140) are great stuff; true oversize fit in light satan finish, they are waring well with just the right heft and softness. I absolute love these sheets. They are abundantly deep pockets! 650 Thread count is all you need. I am a experienced Egyptian Cotton user. Anything above 650 is a waste if you know how to care for Egyptian Cotton. Never use fabric softener, or softener sheets. Wash 5-6 times with out soap the first time out of packaging, then once with gentle soap before first use. Always wash with gentle soap then "rest the sheets" for a couple of hours after drying, before remaking bed, or if you can afford, get two sets and rotate sets, so sheets can "rest" in-between changes. If Egyptian cotton is cared for properly, it will get silkier and silkier with every wash/dry, and last for 20-25 years. Well worth the effort and price. (I use hot/cold wash rinse, and hot dry. My sheets are silky and luxurious! and get better every wash. I had a set from 25 years ago from over seas, where I was schooled on how to care for them, and they lasted 25 years and still going! They are like silk! NOTE: Pockets are VERY big. but not a real dislike, I tucked in the extra, and now I do not pull out the corners when sleeping. If you have deep mattress with toppers, this is the height/deep pocket you want. When these arrived they actually were 650 thread count, so I just knew they would be soft and comfortable. Wrong. They are not at all soft and I washed in cold water and ironed them to increase the comfort, with no improvement. The package they arrived in and the interior label, state that they are 100 % Egyptian cotton, 650 thread count, but the quality of workmanship is not great. I would not order these again, even though the price is excellent. I bought an extra set of these Egyptian Cotton 650 TC Pillowcases in plum to coordinate with the Queen size Egyptian Cotton 650 TC sheet set I had previously bought from Overstock.com in plum. The pillowcases and the sheets are awesome! They are soft and the plum color was very rich looking. So glad I can purchase extra pillowcases as well. These Egyptian Cotton 650 Thread count pillowcases are a dream! super soft and they come in very pretty and serene colors. I love the slate blue tones. I've 2 sets of the matching sheets & several sets of extra pillowcases. These are superb quality! They'll need a few washes once the original sizing is removed with 1st wash but get softer & softer as used. Great mid weight sheets, I have the lightest blue & ivory, I mix and they look beautiful and feel soooo soft. I've several sets of the same brand in heavier weight for winter, 1200 TC. FYI, I've had these for 3-4 yrs, they just get better! No pilling, no color fading! Some reviews mention pilling; these r quality linens, if they're pilling they're not being changed every week as they should; pulling occurs w poor quality weaving & human rubbing on dirty sheets. These are wonderful! Great purchase! I have the white in the heavier TC & it's a beautiful soft white! We live in the mountains & use this weight in the summer as it still gets chilly at night. Buy these, treat them well & they'll give you yrs of comfortable bedding! In hotter climates u will only need the top sheet for warmth during the warmer months. I LOVE!! The size of the pillow cases! Roomy so pillows do not stick out of the end. Great purchase!!! Love sateen bedding-looks and feels great! I purchased a complete set of the Superior Egyptian Cotton 650 bedding-Duvet set, queen sheets and pillowcases. Looks luxurious and has minimal wrinkles if removed from dryer when mostly dry and put back on the bed. Feels soft and cool to the skin. Like the soft muted Teal and Sage colors which blend together well and look good with a very patterned rug in my bedroom. These pillowcases not size indicated. I ordered these and another set of pillowcases from Overstock at the same time. I needed new ones that would accommodate my new thicker pillows, so picked because they had a stated width of 21 in. The other pair are great, but these are barely 20 in. and I had to wrestle my pillows into them. Also disappointed that the collor is much darker than indicated in picture. For years I have purchased pricey "luxury" sheets from a linen warehouse store, but they can't compare to these. Soft as can be, and these really don't wrinkle much. Best of all, they truly DO fit an extra-deep mattress that is topped with a 3-inch memory foam--no more struggling with that fitted sheet! Not only are these better than what I had been using--they're also cheaper! An excellent value. Was looking for pillow cases that would be extra soft and comfy. These were perfect. So smooth against the face. Would definitely buy these again! They were perfect. Alas th e person I got them for died 2 days before received them. I contacted you and with your help and understanding I had no problem. ou were great. Love overstock. The high thread count pillows are awesome. Super soft. The new big fluffy pillows need pillowcases bigger than 'normal'. These are an extra 1" wide and go on the fluffy pillow quite easily. Love the fabric, feels like quality! Very happy with service and merchandise. I purchased these pillowcases to accompany the 650 thread count sheets I also purchased in order to fit my larger pillows. I love the luxurious feel of the Egyptian cotton and the elegant pleated detail on the hems. These pillowcases seem to be good quality. They’re softer than I thought they would be. Overall I’m happy with my purchase. We love this wonderful Egyptian cotton set. They are durable AND luxuriously soft at the same time. We certainly plan on buying more ... just to have the additional colors. I ordered the queen size sheet set and an extra set of pillowcases in burgundy. The color is rich and beautiful and more a true burgundy color and less of a plum than shown on my computer monitor. They have been washed once and used for several days. They wrinkle slightly but still look great. They are a tight weave and very soft. Would purchase the same set in the future. Not a real 650 thread count (made in China), it explains everything. Cheap cheap cheap. Great quality. Very well made. Soft. Super soft and luxurious! We had to buy extra pillow cases because we have a lot of pillows and these match the sheets set we ordered perfectly! "I want QUEEN pillow cases....Your options do not reflect that. How do I order 2 sets of queen pillow cases ??" These pillow cases are available in Standard: 21 inches wide x 32 inches long and King: 21 inches wide x 42 inches long. You can make your selection by using the options drop down menu. My order contain a pair, or in other words two cases. The pillowcases are only offered in standard and king sizes. "Is "standard" considered Queen or Full? The word is misleading." Standard is a smaller pillowcase than queen, it would be the size you receive in a regular size bed. Queen sets have queen cases, king sets have king. "Hello, Where can I find the sheet set that matches these pillow cases? King size white." "What is the depth in inches of the fitted sheet? I have a big mattress & it's so hard to get a standard 15" fitted sheet on it. I bought a 24" & that is too big. Guessing 18"-21" might do the trick!" Hello tangobella, this will fit a mattress up to approximately 18 inches. Thanks for shopping with us! "Do these pillowcases have an envelope closure? (I mean, do they have that "flap" on the end to keep the pillows nicely tucked in?)" Hello franli, no, they are just standard pillow cases. Thank you for shopping with us! "If you are out of a particular color, when will it be back in stock? I would like to order the standard pillowcases in grey." Hello Bailey W., items are restocked as they become available; however, we cannot guarantee an item will be restocked. Thank you for shopping with us.